Of the sleeve folded right sides inside, and sew smatyvay seam width of 1.2-1.5 cm Seams in the products of wool and silk fabrics rautureau or iron depending on the model, and in the products of cotton fabrics folded to the side. Bottom of sleeves treated by open line (to connect sections of hoses) or a closed line depending on the model. Sections of sleeves, the bottom of which is treated by open line connect with the top and bottom edges of the edging, borders, piping, cuffs, was, respectively, at the same level.The seam allowance at the bottom of the sleeve attached to the sleeve double reverse stitching across the edging, borders, piping at the distance of 0.3-0.4 cm from the cut edge of the sleeve. The length of the lines should be at least 0.7-1 cm seam Allowance must not be visible from the front side of the sleeve. Handle the bottom of the sleeves, seam bodybu. Bottom of sleeves with cuffs (Fig. 525) and the bottom of sleeves in the articles of cotton and linen fabrics bend on the wrong side of the bottom line bending, shear bends inward 0.7-1 cm, primetyvajut and zastrugivajut on the machine at a distance of 0.1-0.2 cm from the bent edge. In the products of wool and silk fabrics and knitted fabrics of the sleeves bend on the wrong side and attach to the sleeve seam itagiba with a shut cut hand with hidden stitches.Depending on model and fabric, the bottom sleeve can be processed by the seam bodybu open or closed manual cut crosswise stitches. Handle the bottom of the sleeves, seam bodybu education imitating cuffs. On the wrong side of the sleeve plan a line that defines the width of the cuff. Allowance for the bottom hem of the sleeve to bend towards the inside, put the lower section of the sleeve on the planned line. Then trace the sleeve cut sew and zastrugivajut it. Lines are fitted to the lower section of the sleeve was located inside the folds. Imitating the cuff folded in a direction opposite to the sleeve, and priorivet. Distance of stitching from the top edge of the cuff depends on the model (Fig. 526). Handle the bottom of the sleeve cuffs. Banded cuffs straight cut one-piece. A closed cuff is folded across the middle face inward, equalize the slices and sew them with a seam width 0.5-0.7 cm (Fig, 527, b). Prituri seam, cuff turn on the front side, fold along the middle underside and inside priorivet. If for model the ends of the cuffs should be fastened to the loops and buttons, oblachnyy loop handle on the top side of one end of the cuff (Fig, 527). The cuff is folded along the middle face inward, equating slices, and grind the ends, putting the loop of vetochnogo or braided cord. Joint width of 0.5-0.7 see the Seams, in corners cut, turn the cuff on the front side, straighten seams and priorivet. 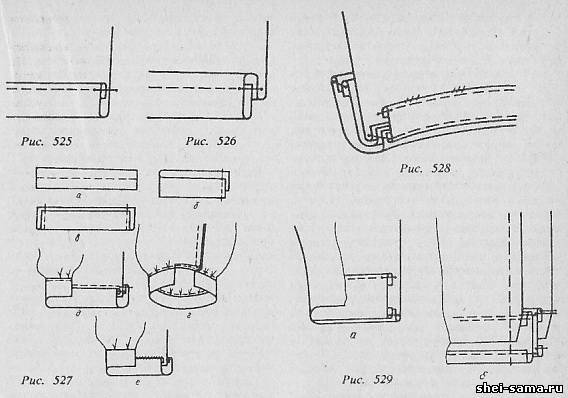 The lower part of the plot obtekanii loop is cut, the sections bends inwards, forming Kant from otacek, and manually sew hidden stitches.The cuff consists of two parts, process obecnym seam. First, grind off the ends of the upper and lower parts of the cuff seam with the width of 0.5-0.7 see put cuff Inside the bottom part, combine the seams of the piecing together of the ends, equalize the cuts and grind the top edge. In cuffs, which the upper edge of the figure, the seam on the concave areas netscout, cuff turn on the front side, straighten seams and priorivet, forming edge with a width of 0.1-0.15 cm in the lower part of the cuff. Sleeves with cuff without a section for the free passage of the hands leave the area where the cuff is not pritachivajut. This plot is treated with the seam bodybu closed cut (Fig. 527 g). Banded cuffs put on the wrong side of the sleeves the bottom part down and pritachivajut from the bottom of the cuffs, laying on the sleeve of ndsatcom folds or forming Assembly. In the sleeves without cutting the cuff pritachivajut to the ends of the treated area fell under the line of protecive bottom of cuff at 0.5-0.7 cm (width 0.7 cm). Sections of a seam folded towards the bottom of the cuff.Cut the upper side of the cuff bends to the inside by 0.5 cm so that bent edge of a closed line of primaqiune the underside of the cuff and scribbled it at a distance of 0.1 cm from the bent edge (Fig. 527 d). In the sleeves without cutting the seam of the sleeve can be ground off after primaqiune cuffs. Sections of the seam at the bottom of the sleeve attached to the sleeve on the machine by a double line. You can partecipate to the upper side of the sleeve cuff, and cut the lower part to bend, closing the line of primaqiune cuffs. In this case, manually sew hidden stitches blind stitch (Fig. 527 e). Fold-over cuff (Fig. 528) can be connected to sleeves with piping, piping or without. The inner sections of otacek, cut to shape of bottom of the sleeves, bends towards the inside of 0.5-0.7 cm and zastrugivajut at a distance of 0.1 cm from the edge. The finished cuff is worn on the sleeve, aligning the front side of the lower part of the cuff against the face of the sleeve, the cuff put on a face facing to the cuff, stack the slices, primetyvajut and pritachivajut from obcutek seam with the width of 0,5-0,7 cm Seam folded in the direction of the piping and scribbled at a distance of 0.2-0.3 cm.The facing folded to the inside of the sleeve, straighten the seam, forming the edging of the sleeve with a width of 0.1-0.2 cm, and priorivet. The inner edge of the piping attached to the sleeve in a few places manually concealed stitches. Treatment of bottom of sleeves without cuffs (Fig. 529 a, b). Bottom of sleeves without cuffs treated with a facing. The facing applied to the front side of the sleeve, the sections of which are not Stacey, and grind the bottom of the sleeves from the piping seam with the width of 0,5-0,7 cm Seam folded in the direction of the piping and scribbled on the front side piping at a distance of 0.2 cm from the edge. The sleeve is folded face inward, equating sections and sleeve piping, smatyvay and grind, at the same time grind off the ends of piping. Seam piecing together the ends of the piping and seam the sleeves on the section length of 3 cm rautureau.The inner edge of the piping bend towards the inside of 0.5-0.7 cm and zastrugivajut at a distance of 0.1-0.15 cm from the edge. The facing folded to the inside of the sleeve, the seam at the bottom of the sleeve straightened out, forming the edging of the sleeve in the direction of the piping with a width of 0.15-0.2 cm, priorivet. The inner edge of the piping to the sleeve hem concealed stitches. Sleeves with zipper in the crease (Fig. 530) at first mark two folds. The front one folds impose a processed loop of vetochnogo or braided cord and attach the markup 4-5 stitches each end. Then lay the crease on nadechka and sew inside out or scribbled on the front side at a distance of 0.1 cm from the fold, positioning the ends of the loops inside the folds. The second crease on the sleeve make for strength sewing buttons. Flatlock or nastraivanie second folds perform the same as the first.Then grind the bottom of the sleeves as well as sleeves without fasteners. Sleeves with slits (Fig. 531) loop of vetochnogo or braided cord attached to the edges of the incision, positioning the ends of the loops in the direction of the cut. The facing of the hem for sleeves with slits cut out along with a facing cut, so grinding the edges of an incision performed simultaneously with the grinding of the bottom of the sleeves after piecing together sections of the sleeve. Treatment of bottom of sleeves cuffs with snap closure, located at an integral part. Incision closure on the whole parts can be processed the same as processing of the clasp facing one (Fig. 532 a) or without obrazek. During the processing of a fastener without obcutek first plan the cut lines and the planned line item is cut, making at the end of the cut undercuts at a right angle by the amount of 0.5-0.7 cm Parallel to incision closure, departing from the lateral undercuts of 0.5-0.7 cm, buckle slices (Fig. 532 b). On the edge forming the upper side of the clasp, cut bends towards the inside, and on the edge forming the lower side of the fastener, on the front side. Tuck the slices into 0.5-0.7 cm and zastrugivajut seam itagiba with a shut cut at a distance of 0.1 cm from the edge. The lower part of the treated cuff is applied to the underside of the sleeve, call the edge of the zipper with the edges of the cuffs and pritachivajut (Fig. 532 g). Folded cuff, seam primaqiune the bottom of the cuff to reinflate it, directing it towards the cuffs. Cut the upper part of the cuff that bends inward at the 0.7 cm and scribbled on the distance of 0.1 cm from the line of primaqiune the bottom of the cuff. Treatment of bottom of sleeves cuffs with snap closure, located at the end of the seam. The seam of the sleeve on the fastening area when cutting make allowances. Cut seam allowance, forming the upper side of the clasp, bend towards the inside of 0.5-0.7 cm and zastrugivajut at a distance of 0.1-0.2 cm from the bent edge (Fig. 533 a). Cut seam allowance, forming the lower side of the chain, is treated with a facing, cut to shape of stock (rice, 533 6). The inner section of piping bend towards the inside of 0.5-0.7 cm and zastrugivajut at a distance of 0.1 cm from the edge. The facing applied to the front side of the zipper face down and grind the item from the piping seam with the width of 0,5-0,7 seeThe facing folded to the inside of the sleeve, straighten the seam, о6разуя Kant in the direction of the piping with a width of 0.1-0.2 cm, and priorivet. The inner edge of the piping attached to the primary in a few places manually concealed stitches. After processing the edges of the clasps is produced skiving cuts of the sleeves (Fig. 533) to the end of the machined clasps, the part is turning at a right angle and fasten the treated allowances clasp with double stitching. The lower part of the cuff applied to the underside of the sleeves and pritachivajut seam with the width of 0.5-0.7 cm section of the upper part of the cuff that bends inward at 0.5-0.7 cm and scribbled closing line of primaqiune cuff (Fig. 533 g). The clasp and cuff priorivet. The connection set of hoses with the product. Lifts the shoulders at first lay two lines with distance between them of 0.5 cm (in the machine or by hand), thread tightening, dispensing fit depending on the model, evenly across the crown or just in front and the ulnar part of the. Fit securevault. To protect the openings from stretching on its edge in areas down from the shoulder seam 10-12 cm and at a distance of 0.7-1.2 cm from the armhole cuts are paving the engine line. Sleeve umatyvaet and stachivaya in armhole from sleeve seam width of 1.2-1.5 cm Slices overcast seam. The main volume of modern products is concentrated in the upper part due to the loose-fitting bodice and sleeves (various kind, full-cut shirt casual and other) to various arm openings: more in-depth, square. In the processing of these products do not require pokazywanie the armholes on the edge (edge not put). To deter the armholes from stretching can be applied a strip of calico, cut in the transverse direction. When processing soft forms in case of reduction of solution a chest tuck or complete absence of shelves in the region of the openings slightly sativum. The magnitude of stivania should be small, because for this cut the armhole should lie freely and not be tight. Stitch sleeves into square armhole. On the shelves under construction with a cutting sideways, make the notch in the corners of the openings at an angle to the line of connection of the barrel with a shelf, not reaching a line of 0.1 cm On the back make the notch at the location of the corners of the openings. Reinforce the notch with strips of cotton fabric to avoid a rupture in the process of socks. Stripes cut on the bias yarns with a width of 3-4 cm, 4-5 cm and folded in half lengthwise, place fold it to the side of Tachibana sleeves. Pritachivajut in the area of the notch.The strip is bent in the direction of the seam allowance of the sleeve and scribbled on the margin for a distance of 0.2 cm from the seam primaqiune (Fig. 534 a). Setting a sleeveless shirt cut in a square armhole produce in the open armhole, i.e. the bottom seam of the sleeves sew at the same time with the side seam of the product after vrachevanie sleeve in the armhole shelves and back (Fig. 534 b). Seams vrachevanie sleeveless shirt type, you can Topstitch the armhole. Connection sleeveless shirt-style with square neckline in lightweight products can be produced overlaid seam with one open cut. The wider the sleeve, the less or is not required to produce wet-heat treatment, the narrower the sleeve, the harder it is for heat-wet treatment. Sleeves vtachnye or televissionnykh the greater the angle of inclination of the sleeve relative to the shelf and back, the more pulling on the area under the armhole, the smaller the angle, the easier the wet-heat treatment (Fig. 535). If by design, the front and rear sections of the sleeve shirting type have deflections, the sections and the bottom of the top part of the sleeve slightly retracted (Fig, 535 b). Treatment of the armholes with facing, cut to shape armholes (Fig. 536 a). The inner sections of obcutek bend towards the inside of 0.5-0.7 cm and zastrugivajut at a distance of 0.1 cm from the bent edge. The facing applied to the front side of the armhole face down, stack the slices and grind the sections of the armholes, seam width 0.7 cm In the lower part of the armholes, a seam in two or three places netscout before reaching the line of 0.1-0.2 see the Seam folded in the direction of the piping and scribbled on the front side piping at a distance of 0.1-0.3 cm from the seam. The openings facing the bend on the wrong side of the product, the seam is straightened and priorivet, forming in the direction of the piping, edge width 0.1 cmThe inner edge of the piping attached to the shoulder and side seams, the back and the front manually concealed stitches. Processing armholes edged with seam. For processing armholes edged with seam obtachku cut out the shape of the openings or at an angle of 45' to the warp threads. The width of the piping depends on the width of Kant and the method of processing. In the products of wool fabric cuts the armhole edging, seam is treated with one open cut. The inner section of piping overcast (Fig. 536 6). The facing applied to the front side of the openings face inward, equating slices, grind armhole. From the piping, the facing folded to the inside of the product, skirting and seam forming edge. Kant reinforce machine stitching from the front side of the product into the seam primaqiune piping. The armhole in finished form priorivet. In the products of khlopchatobumazhnoe tissue slices treated with armholes edged with seam with closed slices in half folded the facing (Fig. 536). Obtachku bend along the middle underside inside, slices call. Cut one end of the piping bends inwards by 1 cm and placed on the front side of the openings bend in the direction of the product. Sections of piping and openings equalize and grind from the side of the piping. While the raw end of the piping needs to go over processed for 1-1,5 see the Facing folded to the inside of the product, skirting and seam forming edge.Kant reinforce machine stitching from the front side in seam primaqiune piping in place from the inside should definitely get a bend in the piping and stitching must take place at a distance of 0.1-0.3 cm from the edge (bend). The armhole in finished form produisait.